To change the size of an artboard, you can do so in the properties panel. Once you have all of your artboards designed, the last step is to export it (export as “…,”) and select the file types that you would like each graphic to be. Then, with the click of one button, all of …... Change the dimensions of the artboard by either selecting a preset from the pop-up menu or typing a width and height manually. Click the triangle to the left of the Advanced section to open it ( Figure 3.6 ). 22/10/2015 · I used the Artboard tool but when I tried to change the size in the menu bar like I do when I scale in Photoshop. That centered a smaller Artboard cropping off the right side of my map. I moved it but it moved the Artboard and the "work". I went in your way - praying it was still there since I'm on CC(2014) and it is. I found little toggle handles that I could drag to make the board a better... Change the dimensions of the artboard by either selecting a preset from the pop-up menu or typing a width and height manually. Click the triangle to the left of the Advanced section to open it ( Figure 3.6 ). The option to change the canvas size from the old menu item, instead of altering with the artboard tool would make things more intuitive and easier to use. So - this is a feature request to add the option (maybe just a checkbox in the Options bar, or an added Preference) to resize artboards in the same way as the artboard tool works.... Change the dimensions of the artboard by either selecting a preset from the pop-up menu or typing a width and height manually. Click the triangle to the left of the Advanced section to open it ( Figure 3.6 ). 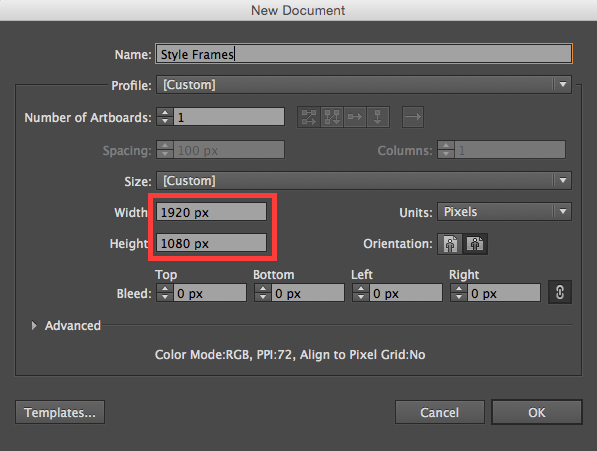 A trick to change the artboard size to be centered: In Illustrator the functionality is there. Actually, since its beginning the resizing of the artboard was only on the right side ! The option to change the canvas size from the old menu item, instead of altering with the artboard tool would make things more intuitive and easier to use. So - this is a feature request to add the option (maybe just a checkbox in the Options bar, or an added Preference) to resize artboards in the same way as the artboard tool works.